Sad to hear of the passing of Swedish composer/avant-garde artist Folke Rabe. He did a number of amazing things in his time, but his drone piece “What? ?” remains (together with Tony Conrad’s “Outside The Dream Syndicate” and Eliane Radigue’s “Trilogie De La Mort”) the pinnacle of long-form/drone music for me. It’s also one of the pieces of music I’ve listened to the most in my time, and the 1997 release on Jim O’Rourke and David Grubbs’ Dexter’s Cigar label is as close to I’ve ever come to wearing a CD out. I only met Mr Rabe once, in 2008 at Fylkingen in Sweden, when he presented a mind-blowing four-channel version of the piece. Together with Tommi Keränen I talked to him afterwards and he courteously told us the genesis of the piece (I later found he’d posted a detailed story on his website, no doubt after having fans like us pester him about it over the years). 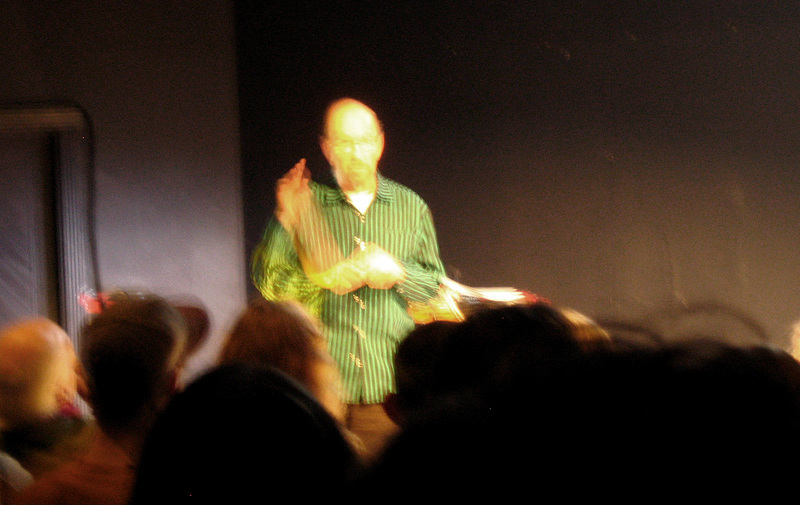 Here’s a blurry photo of Rabe from that evening, with his hand in two places at the same time. Another legend gone, but the music remains. Adieu.